I’ve read before that the oldest surviving work of literature is the Epic of Gilgamesh, engraved on ancient Babylonian tablets 4,000 years ago. But no doubt our need to tell stories goes back beyond this, oral storytelling and art, for example in the form of the ancient cave paintings, both fulfilling this ancient, human desire. Much in the way that local folklore gives definition to landscape and the world that surrounds us, did ancient man also make sense of his world with such creations? The examples in the sidebar image are clues passed down to us that survive in written form, but what about before these? If only we could trace the lineage back, the evolution of storytelling, back into those obscuring mists of pre-history to rediscover the very first story, and pay homage to that very first storyteller, maybe sat around a fire or in a flame-illuminated cave, speaking into being the first myths and tribal histories. Explaining events that gave fuel to a people evolving to wonder at origin and meaning, weaving a magic that still enchants today. I thought I’d reblog this after recently talking to someone about the power of storytelling-and the ghost of Annabella. When I went to Primary School, there used to be a name whispered in the corridors and classrooms that all of the kids knew: Annabella. Annabella was the name of the ghost of a girl who was said to haunt the girls’ toilets. If I recall the story correctly, it was a girl who was supposed to have hung herself in there. This may be a recurring theme, as when I went to Secondary School there was a story of a boy who had hung himself from the bell tower. What dark imaginations the young have. The thrill in being scared. But that latter school story was more vague, the boy-ghost being anonymous. In my junior school the ghost had a name. The second of The Northlore Series of books is out today. 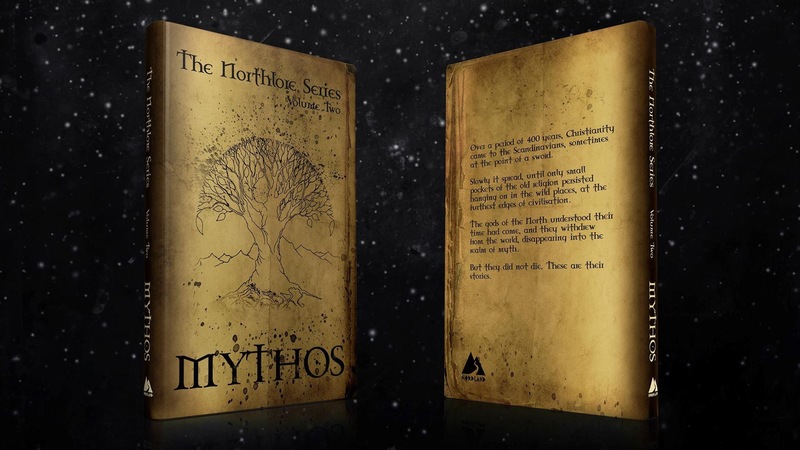 A planned trilogy of books, the first volume was called Folklore, and this second one is called Mythos. I have two short stories featured in it. The premise of this one is that since the advent of Christianity 2,000 years ago, the old Norse Gods didn’t just cease to exist but continued on, right through to the present day. These are their stories. There are tales of different times and different places: from the Russian Plains, to the Somme, to a cafe in New York. A varied collection that holds something for everyone, it is a great companion piece to Folklore. In Folklore, I had included a poem about a Mara, and a story about a Myling. A reviewer (in a good way), described my story as ‘Murray’s bleak take on the Myling legend’. If he thought that was bleak, wait until he reads my World War One tale in Mythos! Though I liked ‘bleak’. I think I’ll take that. The books contain humour, too. There is a good balance throughout: light and dark, prose and poetry. We were in the car and everything was subdued: it was late afternoon and the kids were both asleep in the back, exhausted from their play on the beach, my wife sandwiched between them both. Gathering clouds were threatening to bring some welcome rain. My friend, Derek, was driving, weaving along the country lanes, passing the time trying to identify the various victims of roadkill splayed along our route. Then my eyes lit up at a sudden sign: Ancient Burial Site. Derek started following the directions in a tacit understanding: some of you older Jackdaw followers may recall that the Neolithic is my thing. (Not because you hail from the Neolithic yourselves, of course, but because I posted about it a few times in my early blogging days.) It is the period when we began to become us, ceasing to wander and instead put down roots. Transforming the landscape and, though so much is unknown, leaving just enough tantalising clues to feed the imagination. The structures of this period have always drawn me, wherever I find myself, and so we arrived at the site that is known as Pentre Ifan. “Do you want to come and see it? We could take it in turns?” I asked the Mrs who still had the heads and the spread limbs of the children across her. “And I’ll give you the feel of the place,” I added. And so we abandoned them in that country lane, passed through a wooden gate, and came upon they type of ancient structure that is known as a dolmen. Though the landscape may be different to what it was back then, the fact that there wasn’t another soul or building in sight, added to an absence of sound, (aside from a crow calling), added to the sense of timelessness about the place. The caw of a crow is not sweet birdsong, but is dark and ominous and deathly, (carrion crow after all), but that may just be the perspective and penchant of the poet. There was an information board that gave a diagram of how it would have looked back then. It was built around 3,500 BC. Who would have been buried here? Who (and there would have been several) was important enough to warrant such a memorial? Whenever I look across the fields and ruins that dot the British landscape, I often wonder about the great stories that have become lost to us. Stories that tell of the exploits of people from all periods of our history, undertaken before records began. Legendary figures; famous battles; Gods; Celtic warriors – the Arthurs of the time. But this monument was built long before the Celtic era. Approaching it it looked an obvious health and safety risk, but the stones had been secured. And besides, these things had obviously been made to last. The top stone was shaped like a flint knife. That seemed more appropriate than a hovering spacecraft, which also crossed my mind. Derek left me to spend a few minutes there, alone, to soak up the atmosphere. I’m like that-a human sponge of the vibe of a place. And then I left, the crow still calling its lyrical lament. The ancestors: unknown and unfathomable, littering this island of mine with some extraordinary wonders. I have since read that local lore says that fairies are sometimes sighted there, described as ‘little children in clothes like soldiers’ clothes and with red caps.’ I wished I had known that then, I would have regaled the kids with such tales. That’s the kind of thing to engage them. But I didn’t know, and when I got back to the car they slept on, that damn Justin Bierber playing on the radio. Give me the crow any day. On this day is remembered the Irish saint Máedóc of Ferns, born around 558. According to Irish legends, when a boat could not be found to take the infant Aedan (Máedóc’s original name), across the lake where St.Kilian waited to baptise him, the boy was floated to shore on a slab of stone. The font at St Mogue’s in Bawnboy is said to be made from part of the stone. Will come in handy if ever the churchyard floods. He studied at Clonard Abbey, the famed school of St.Finnian. When many people came to seek him out, desiring to be his disciples, he fled to Wales to study under none other than St.David. These saints do seem rather clicky, don’t they? Along with St.Cadoc (another name drop there) Máedóc was said to have exterminated an army of Saxons or Irishmen in a narrow valley by rolling stones upon them. The monastic site at Clonmore is in ruins. Here some cross fragments and carved stones have been collected together. He was noted for his benevolence and hospitality (though perhaps not to Saxons or Irishmen). At one point, a man pushed him into a lake to see whether he would lose his temper, then, when he meekly got back out of the lake the tormentor confessed his guilt and apologised. He was well known for his curses. Once, when he was grinding flour, a local man begged for some meal. After being given some, the man disguised himself as a blind man and returned to beg for more. Annoyed, Máedóc cursed him that the generations of his descendants would never lack for a blind member. Sins of the father and all that. When a notable figure slew his own father-in-law, he attempted to accommodate the saint, only for him to curse that the man’s right hand would wither to a stump. When the man begged for a penance, Máedóc directed him to pray for forgiveness at the tomb of Brandubh in Ferns. The man did so, and a spectral voice from the crypt forgave him. Miraculous. Marvellous. He still lost his hand though. Many more stories abound concerning this seventh century figure. Once, fetching ale for his fellow monks, old butter fingers broke a jug. Making the sign of the cross over the broken shards, the jug repaired itself and he continued along the way. As a former teenage glass collector, I can tell you there is definitely a market for this kind of trick. Stained glass window of the Saint in Enniscorthy Cathedral. I like the story about the time wolves devoured one of the calves at the monastery, the mother cow being inconsolable. Máedóc blessed the head of his cook and told him to offer it to the heifer. The cow licked him with its great, rough tongue, and from that moment ‘loved him like a calf’. Oh, how that cook must have leapt for joy whenever he heard it lowing mournfully in the barn. Think I’d have preferred a withered stump. One thing I love about the tales of these Celtic monks is their affinity with, and connection to, the natural world. Perhaps there is a moulding here of both the native pagan and early Christian faiths, back in the melting pot of these islands. There is a nice tale of Máedóc reading one day in Connaught, and a hunted stag in desperation took refuge with him. By a miracle, the saint rendered the stag invisible, and so the pursuing hounds ran off. In art the figure of a stag remains this saint’s emblem. A visible one, of course. An invisible emblem wouldn’t be much of an emblem, now, would it? Aeddan, forever known as Máedóc, died on this day in 632, (or in an alternative account 626) and is buried on Lough Melvin’s shore in County Leitrim. Give him a thought before you turn out the light tonight. On this day in 1900: a real-life mystery. Any theories? It is well known, I think, that people like to read ghost stories around the Christmas season, but how about a real-life December mystery? The Flannan Isles are located thirty kilometres west of the Outer Hebrides, in the Atlantic Ocean. Celtic monks lived on those desolate islands in isolation, until they were abandoned for a thousand years. There are the remains of a chapel there, said to have been built by the Irish monk St.Flannan. In 1895 a lighthouse was built there, to warn off ships, passing in those treacherous waters. 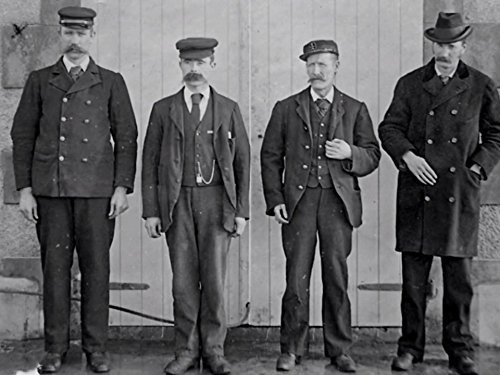 In 1900, a three man crew of James Ducat, Thomas Marshall, and Donald MacArthur arrived for a two week posting, just in time for the hostile winter to set in. I am not sure who is who in this photograph, but at least one of those three men is present in it, maybe the other two are, also. On this day is remembered Edmund, (c841-869), King of East Anglia from around 855. He was killed after being taken prisoner in a Danish incursion, when he refused the Dane’s demands to denounce Christ. This seems enough to qualify the King for sainthood. He is often depicted pierced with arrows like a bristled hedgehog as, according to tradition, his captors tied him to a tree and used him for target practice before beheading him. According to one legend, his head was thrown into a forest, but was found safe (as safe as a severed head can be) when searchers were drawn to it by a wolf that was calling “Hic, Hic, Hic.” It was not an alcoholic wolf with the hiccups, rather the three hics meant “Here, here, here.” My wife could use a totemic wolf when hunting for her car keys. A talking, severed head, though? That’s way too far fetched. I believe it was a talking wolf. The place that he was buried (that is body and head together) became a great abbey around which the town of Bury St.Edmunds grew. Nothing enigmatic about that literal place name, is there ? It is a town that I have never visited. I have been to one about twenty minutes away from where I live that is called Bury. Instead of being a last resting place of a King and Saint, rather its fame lies in the selling of black puddings. One last point: it can be noted how Edmund’s death is similar to the fate suffered by St.Sebastian, St.Denis, and St.Mary of Egypt. I’m not sure if they had a wolf though, speaking or otherwise. That’s a job for Google.